Can you believe it’s already the last week in June, the summer is going by way too fast! 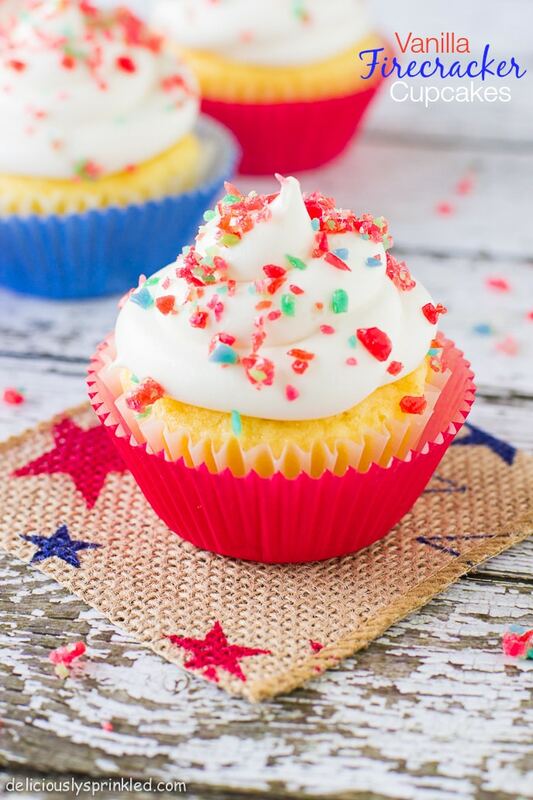 And with all the fun celebrations to attend for the 4th of July next week, I have the perfect dessert for you to bring to all your 4th of July parties, Vanilla Firecracker Cupcakes! And not only are they super cute but these cupcakes are also fun to eat with the Pop Rocks on top it’s like a fireworks party in your mouth with each bite. These cupcakes are made with my favorite vanilla cupcake recipe and topped with vanilla buttercream frosting. I SPRINKLED Pop Rocks on top to dress these cupcakes up for the 4th of July. But you could make these cupcakes anytime of year, they would be perfect for a birthday party or even new year’s eve. The Pop Rocks really make these cupcakes the ultimate celebration/party cupcake and are guaranteed to be a BIG hit at any party! **Check out the step-by-step on how to make the best vanilla buttercream frosting for these cupcakes! In a large bowl, using an electric or stand mixer on medium speed, beat eggs and sugar for about 2 minutes, or until light and creamy. Add the butter and vanilla extract and beat on low speed for about 1 minute, or until well blended. Beat in the dry ingredients on low speed until blended. DO NOT OVER MIX! Add the sour cream and beat until smooth. Fill each cupcake liner about 3/4 the way full with cupcake batter. Bake 18 to 20 minutes or until toothpick inserted in center comes out clean. Allow cupcakes to cool before frosting. Add powdered sugar, heavy whipping cream and vanilla extract. Increase to high-speed and beat for 3 minutes. Add more cream if needed for spreading consistency. Frost cupcakes using a piping bag or knife. Top with Pop Rocks and enjoy! *I highly recommend using heavy whipping cream because it will give the frosting a thicker texture, but you may use milk. 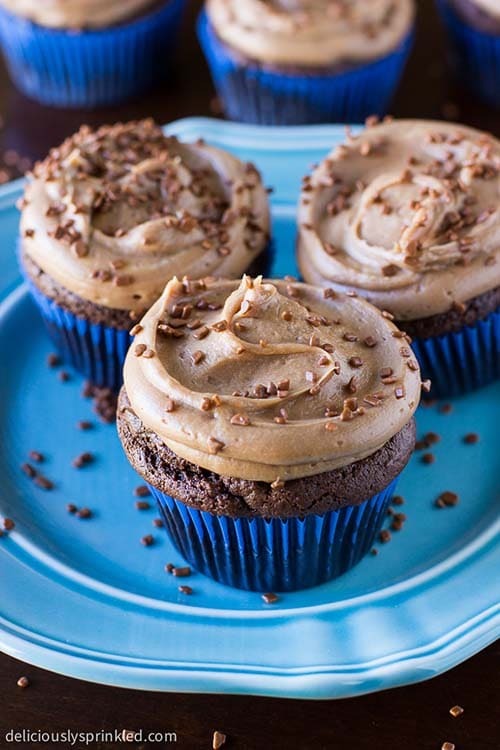 And next try my Chocolate Cupcakes with Milk Chocolate Buttercream Frosting! Can’t really wait to try this! Thanks for sharing. I have a question, do the pop rocks “pop” when you put them on the frosting? Can they be done in advance? How cute are these cupcakes?! 🙂 I love that you decorated them with pop rocks! Such a great idea for the 4th! i haven’t had pop rocks in a LONG time. these would be so fun! Pretty sure I love anything with Pop Rocks Jenn, yum! These are too cute. Must make. TY! These are so cute and festive!! Great for a 4th of July party! These cupcakes look gorgeous, Jenn! So festive, and of course delicious…especially with the pop rocks! Pinned! Pop Rocks on a cupcake?! Genius!!! Why have I never done this??? Loving the step by step photos by the way! Seriously such a fun cupcake for kids! These are so fun! Love the addition of pop rocks! Such fun cupcakes! Perfect for 4th of July! I love these cute and festive cupcakes. And I’m intrigued by your buttercream recipe. I’m totally trying it next time I make cupcakes….which will probably be for the fourth because these are so darn cute. I love, love, love the addition of PopRocks to these … so cute! Pinning these to my 4th of July board! What a super fun idea! Pop rocks were a childhood favorite of mine! 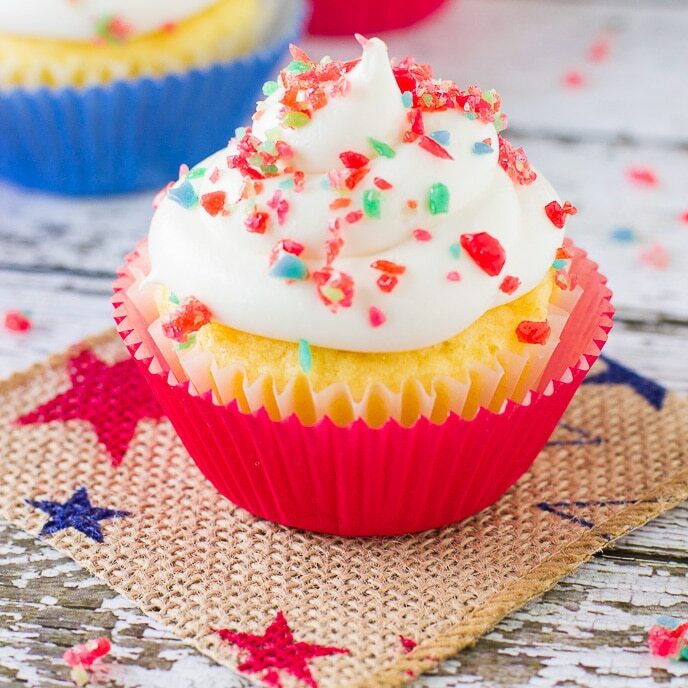 These cupcakes are so cute for the 4th of July! I made some similar cupcakes last year, but I put sparkler candles in them and the pop rocks melted! Haha. It was disappointing when they didn’t sizzle. Your cupcakes look wonderful though! Pinning! Poprocks were IT when I was a kid! Love that we can still find ways to bring nostalgic foods back in a grownup way! Seriously this is a great idea! 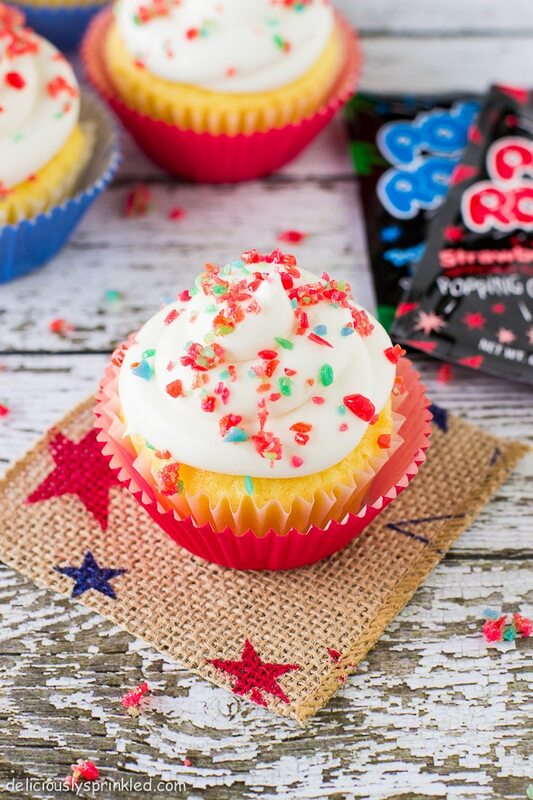 What kid wouldn’t love pop rocks on their cupcake? !